Well it is for most of us. And spring means the return of air potato vine and hopefully the beetles. We are beginning to actively promote and monitor the Air Potato Patrol website and e-mails for this season once again, so watch your e-mail and our blog for updates and surveys. Air potato vine by Sarah Daly. If you fill out the form and mail it to the address for your district (listed on the form) you will be close to the first in line for beetles this year. We will be sending out our first survey of the season very soon asking about when your vines begin active growth in the spring and when (or if) beetles become present. Thank you for completing these surveys and special thanks to those who complete all of them. This gives us important, consistent data for our research. Here are some examples of the results we have gotten from you, our members, so far. Map of our current Air Potato Patrol members and their location. 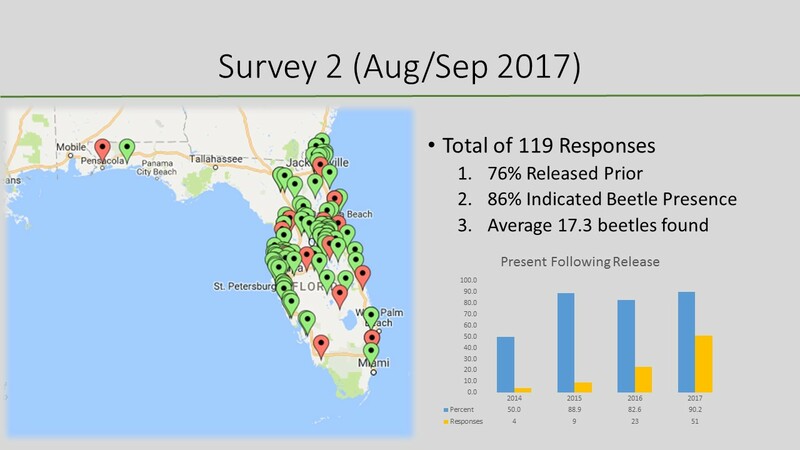 Results from survey 1 on presence of beetles. 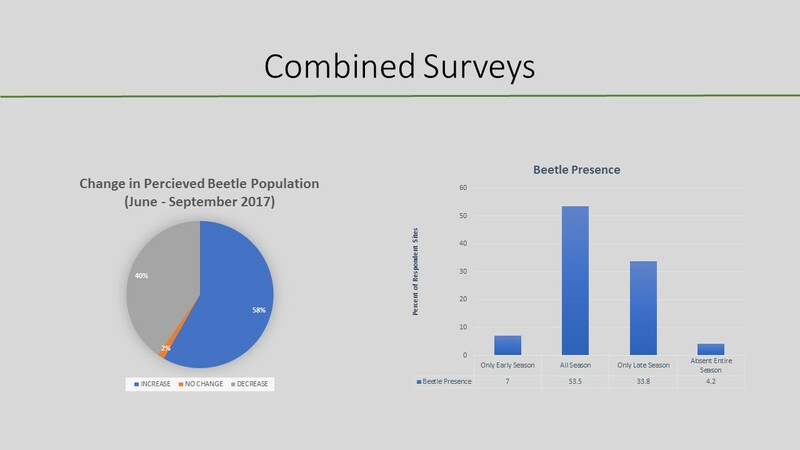 Results from survey 2 on presence of beetles. 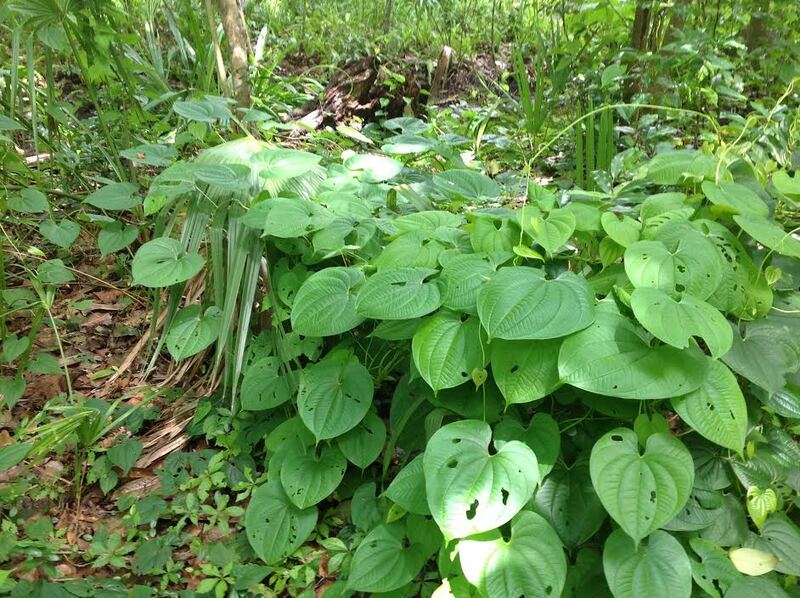 Changes in air potato beetle populations over a summer. So thanks for your help and we are looking forward to a great spring and summer! All this sounds great. I have signed up for more beetles. One thing re. 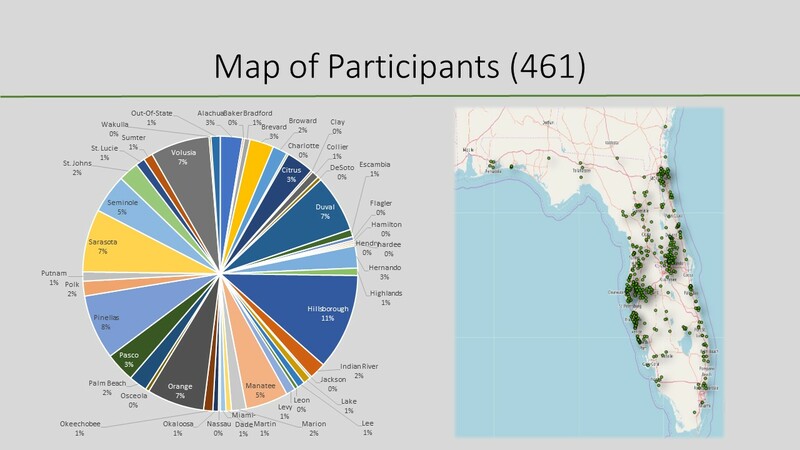 the map / pie chart: I would love to be able to read it, but when I figured out to make it a little larger, the writing was blurred. Any solution to that? Thanks. I increased the size of the images, and if you right click on the image and choose ‘view image’ you should be able to see a full size version. 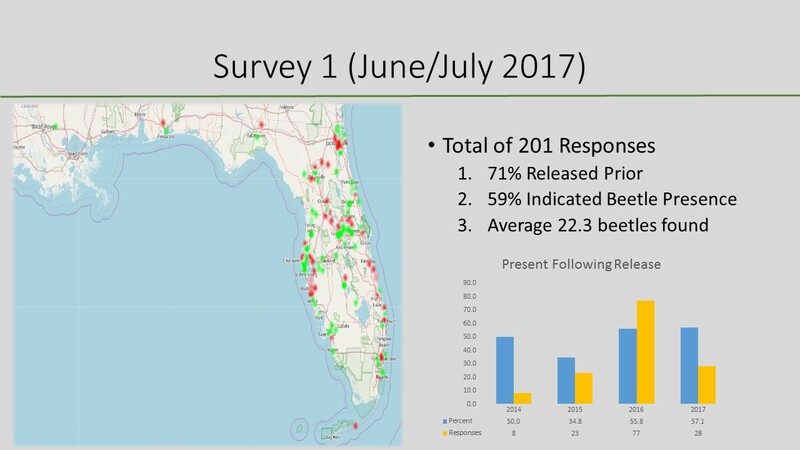 I’m in NE Florida and released beetles twice last year. Not sure whether the freezes we had this winter impacted the vines, or it was a combination of the freeze and the beetles, either way, I have not seen any evidence of the vines returning. Any way we can see the survey results enlarged? I’m sure your freezes killed back the vines, but I’m also sure they will come back sometime this spring. We have to wait and see how well the beetles overwintered in different parts of the state. The data that all of you have been sending us is critical to finding that out. And see the post below for picture size details. You can’t beat the beetles!! !